* Ferraria pavonia L.f., Suppl. Pl. : 407 (1782). Moraea pavonia (L.f.) Thunb., Moraea: 14 (1787). Ferraria tigridia Sims, Bot. Mag. 15: t. 532 (1801), nom. superfl. Vieusseuxia pavonia (L.f.) DC., Ann. Mus. Natl. Hist. Nat. 2: 139 (1803). Tigridia grandiflora Salisb., Trans. Hort. Soc. London 1: 309 (1812), nom. superfl. Marica tigridia (Sims) Lehm., Index Seminum (HBG, Hamburgensis) 1828: 17 (1828), nom. superfl. 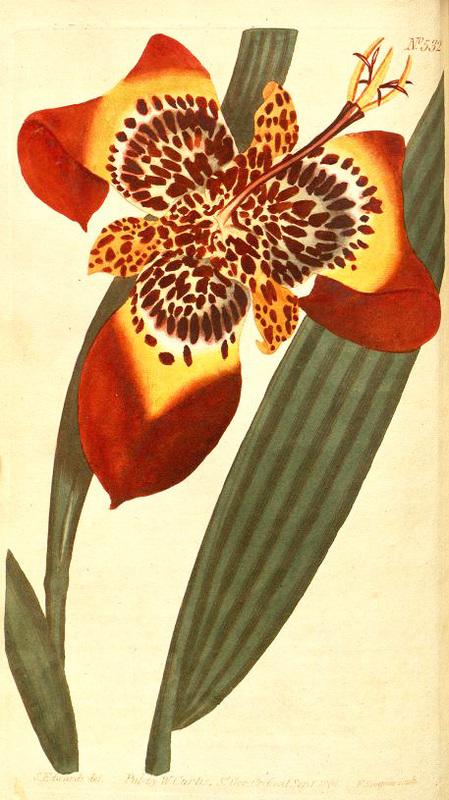 Moraea tigridia (Sims) Baker, J. Linn. Soc., Bot. 16: 136 (1877). Sisyrinchium grandiflorum Cav., Diss. 6: 345 (1788). Tigridia conchiflora Sweet, Brit. Fl. Gard. 2: t. 128 (1825). Tigridia oxypetala R.Morris, Fl. Conspic. : t. 20 (1825). Tigridia lutea Link, Klotzsch & Otto, Icon. Pl. Rar. 2: 85 (1842). Tigridia speciosa Poit., Rev. Hort. (Paris), sér. 2, 2: 447 (1844). Beatonia lutea (Link, Klotzsch & Otto) Klatt, Linnaea 31: 566 (1862). Tigridia pavonia var. conchiflora (Sweet) Baker, J. Linn. Soc., Bot. 16: 136 (1877). Sisyrinchium palmifolium Sessé & Moc., Pl. Nov. Hisp. : 154 (1887), nom. illeg. Tigridia pringlei S.Watson, Gard. & Forest 1: 388 (1888). Tigridia pavonia f. conchiflora (Sweet) Voss, Vilm. Blumengärtn. ed. 3, 1: 985 (1895).